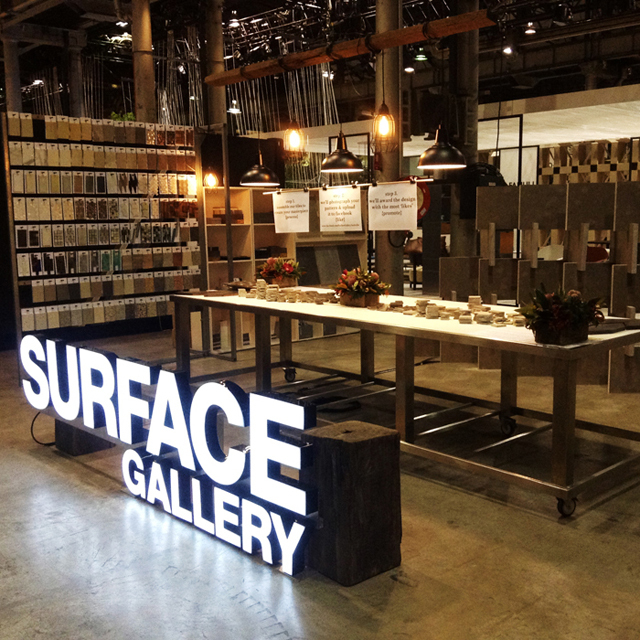 Surface Gallery exhibited in Stand 40 of the Galleria at Australian Technology park. With more than 4,000 visitors over the three day show, we were overwhelmed with positive responses to our collection of tiles, cladding, pavers and decorative feature tile. As well as displaying our vast range of products, Surface Gallery held a competition, collaborating with Lenard Design Associates for THE PROJECT at SYDNEY INDESIGN, where we asked our visitors to explore 'The Process'. We observed the CREATIVE PROCESS, and how a brief is interpreted in different ways when given the identical tools. Our brief to designers who visited Surface Gallery within the Galleria; Create your own unique pattern, design or composition that reflects your design style. The workbench provided each designer with the same selection of tiles consisting of modular shapes in a variety of colours and finishes. Each design registered was uploaded to the Surface Gallery Facebook page, to create an online “Surface Gallery”.